Agriculture and forestry traditionally focus on improving plant growth traits based on an anthropocentric point of view. 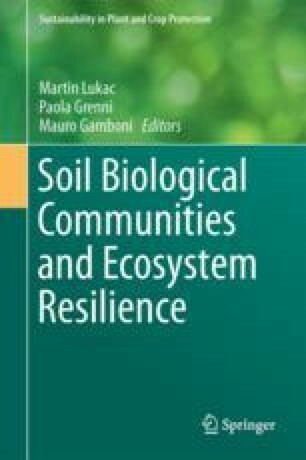 This paradigm has led to global problems associated to soil overexploitation such as soil losses, reductions of the C stock in soils, and the generalized use of fertilizers, which particularly increases the costs of production and pollution treatment. This view may also have limited our understanding of mutualistic symbioses of plants and microorganisms assuming that the main role of non-photosynthetic symbionts is to mobilize the nutrients that are necessary for plant growth and development, and being plants the dominant agents of the symbiotic relationship. In response to these issues, this chapter offers an alternative approach taking advantage of the “rhizo-centric” point of view, where non-photosynthetic partners are the main protagonists in play; and secondly, it builds a multidisciplinary body of knowledge that could be called “rhizoculture”, which includes techniques focussing on the intensification of the development and activity of roots, mycorrhizae, and other symbiotic and free living rhizosphere organisms. In short, rhizoculture may lead to decrease plant production dependence on fertilization and provides other benefits to agriculture, forestry, and the environment. Within this conceptual framework, the first objective of this book chapter is to explore whether there is a “paradox of calcium salts” (i.e., Ca2+ and its salts are simultaneously nutrients, promoters, and stressors for the host plants) that would explain a dominance of mycorrhizal fungi over plants based on inducing a Ca(pH)–mediated chlorosis to the host plants. If this paradigm shifting hypothesis were finally fully verified, it would provide conceptual bases to reconsider our current technologies in agriculture and forestry by introducing the “rhizocultural” approach, based on the management of roots (introducing alternative cultural practices), Ca2+ salts (using liming and other techniques), rock-eating mycorrhizae, organic matter, and the soil microbiome (increasing the presence of symbiotic microorganisms against saprophytes), N and P contents (by aquaculture and smart recycling of organic waste), and the physical properties of the soil (by the activity of soil symbiotic microorganisms and soil fauna, such as ants, termites and earthworms). The development of such new technological approaches in rhizoculture would significantly decrease the high cost and associated pollution of the application of fertilizers and phytochemicals; as well as it would increase soil C stocks, improve the resilience of agricultural and forest systems to environmental disturbances, such as climate change, and enhance food production and security. The authors would like to thank the following people for their corrections, suggestions and discussions on the concepts and models of Rhizoculture: Vicente Monleón, Dave Myrold, Thom Kuyper, Jim Trappe, José Miguel Barea, Domingo Moreno, John Baham, Jennifer Parke, Martin Lukac, Paola Grenni, Mauro Gamboni, Mike Castellano, Maribel Hernando, Francisco Pérez-Alfocea, Jesús Pastor, Miguel Quemada, Kira Hontoria, Rosa Mosquera, Marta Conde, Ana Rincón, José Luis Hernanz, Ruben Valbuena, Paloma Díaz, José Luis García-Manjón, Gabriel Moreno, Sergio Sánchez, Dan Luoma, Anssi Pekkarinen, Danilo Mollicone, Alfonso Sánchez-Paus, José Antonio Bonet, Dani Oliach, Conchi Azcón, Charles Lefevre, José Antonio Domínguez, Salvador Rivas-Martínez, Leo García Sancho, Aziz Türkoglu, Ayhan Oral, Susana Martín-Fernández, Eugenio Martínez-Falero, Antonio García-Abril, Ángel Martín, Fernando García-Robredo and Javi Rejos. Authors also acknowledge Pedro Cifuentes and Escuela Superior de Ingenieros de Montes, Forestal y del Medio Natural for their financial support. BP. (2016). Statistical review of world energy. Available at https://www.bp.com/content/dam/bp/pdf/energy-economics/statistical-review-2016/bp-statistical-review-of-world-energy-2016-full-report.pdf. FAO. (2017). What is organic agriculture?. http://www.fao.org/organicag/oa-faq/oa-faq1/en/. Manzano, P. (2015). Transporte de semillas por las ovejas trashumantes, y sus potenciales implicaciones en la vegetación. PhD thesis, Universidad Autónoma de Madrid. Available at http://hdl. handle.net/10486/670899.